Havana-born Luis A. Campaneria started performing magic at age nine and never grew up. Noticing the demand for his art, the "hobby" gradually became a full time career taking him from coast to coast and abroad. 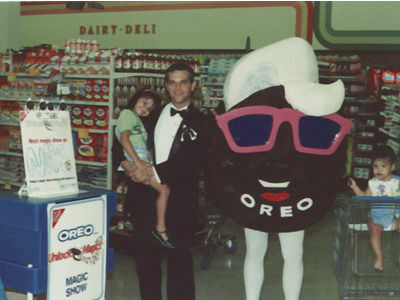 He has performed for companies such as Nabisco for their "Oreo - Unlock the Magic" campaign, and dazzled audiences representing companies like International Home Foods promoting Chef Boyardee with their "Cook up a little magic with your kids". At Trade Shows, Expos and other promotions, he has created a "Magical Memory" for companies too many to name. Luis is no stranger to the media either. He has made guest appearances in numerous television interviews, has had featured roles in TV Programs and movies, as well as taken part in TV commercials. His photo is constantly appearing in newspapers and has even had his balloon artwork featured on a national television network. Luis’ most recent accomplishment was winning the 2018 / 2019 Society of American Magicians national competition in Table Hopping and Strolling Magic, making him the National Champion for 2018 – 2019. He will attend the next Table Hopping and Strolling Magic competition for the Society of American Magicians national convention in Las Vegas in 2020. Luis' skills, professionalism and personable character have made him one of the most sought after magical entertainers. Adults and children alike covet his proficient balloon sculptures. People seem to know when Luis is nearby as they see smiling faces on those who carry his balloon works of art. "Luis is an outstanding talent to have at any trade show! 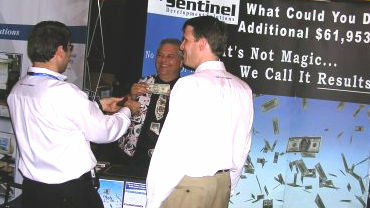 Everyone at the show knew about Sentinel, loved the magic, and REMEMBERED our message. Over the three day show people constantly came up saying, “I’ve heard about you. What does your company do?” and “This is such a great idea…"
"...thank you for a stellar performance..."
"The professionalism and quality performance has always amazed me." "His professionalism, stage presence, and audience interaction are of the highest quality." "It was a magical experience."